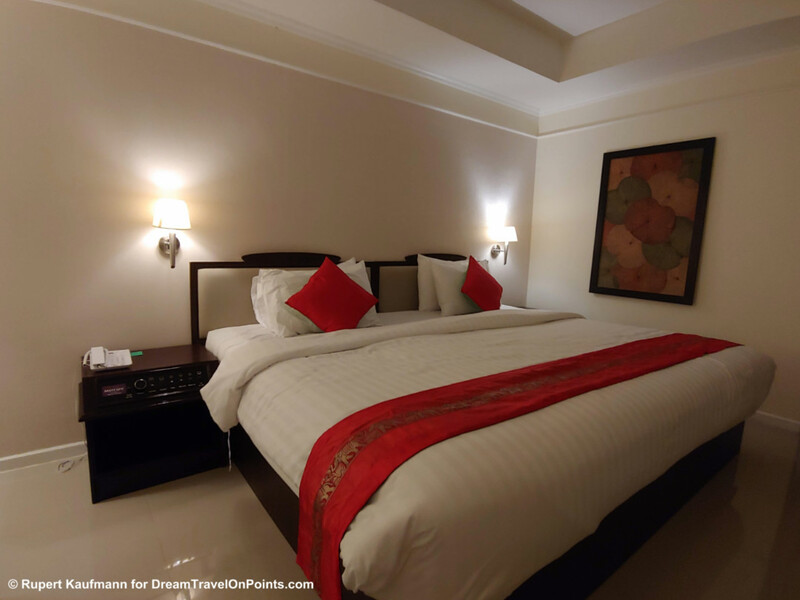 Review: Mercure Chiang Mai – good value, friendly service outside the old town! The Mercure Chiang Mai offers large, well equipped rooms, fast WiFi internet, full-service amenities like a pool, spa, restaurant and room service at a low price. You have to live with the older property and the location North of the old town. While this is not ideal for first-time visitors, if you are looking for good value anddon’t mind the walk or a grab ride, the Mercure is a solid choice. 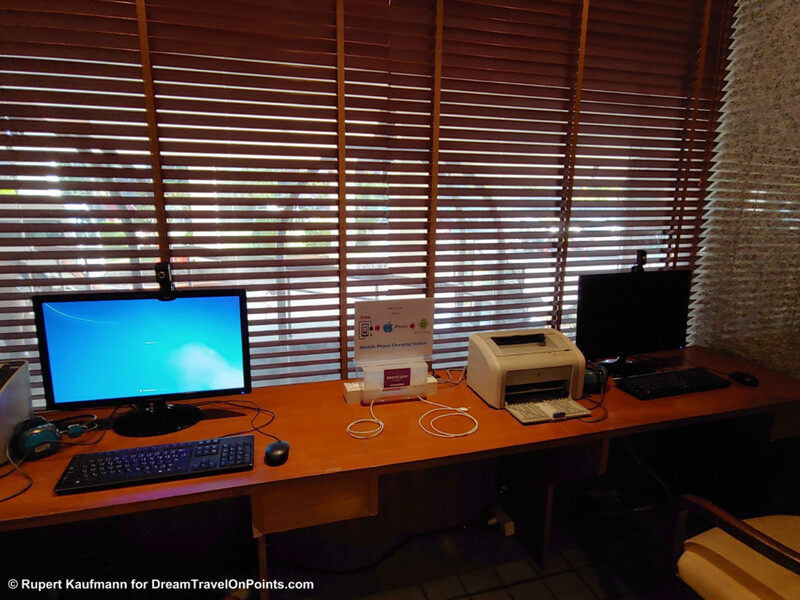 Check out the detailed review and photos, to see if it’s a good fit for your travel plans! Location: The Mercure Chiang Mai is located approximately 800m North of the moat surrounding Chiang Mai‘s old town. That makes it about a 10min walk into the old town and 20 minutes to the many sights and restaurants there. Grab ride hailing is cheap and you can reach most places in the old town in 10-15 minutes. The Chiang Mai Airport is about 20-30 minutes by car and the bus station for trips to Northern Thailand about 15 minutes. There is a small mall with a grocery store, a travel agent, spa and other services next to the hotel. There are also a few bars and restaurants, although they are not as inviting as in the old town. The neighborhood surrounding the hotel feels more like a suburb, with commercial properties and residental building, old and new, all mixed together. The location of the Mercure Chiang Mai is not ideal for a visit to the city, but if you don’t mind walking or are comfortable hailing a ride, it’s ok.
Service: The staff at the Mercure Chiang Mai is well trained and very friendly and attentive. There was no wait at the front desk and the staff had my check in prepared. They processed the paper work, provided me the Accor LeClub Platinum amenities and all the information I needed about the hotel. Housekeeping had done a thorough preparing my room, it was clean with all amenities stocked and everything in working order. Staff at the restaurant was equally well trained and polite. They kept the tables cleared and the breakfast buffet stocked. Room: I booked a Standard King Room and was upgraded to a Deluxe King Room. They are located on the top floor of the hotel and have additional amenities, like bathrobe and slippers, but are the same size as Standard or Superior Rooms and not worth to pay extra. The Mercure Chiang Mai is an older hotel, but it’s clean and well maintained. The room has a very traditional decor, with beige floor tiles, white walls and dark wood furniture with beige upholstery. Red pillows and a bed throw as well as a painting provide a much needed splash of color! The room is large at 32sqm (350sf). The king-size bed has a firm matress and good quality sheets, comforter and pillow – I slept well. Near the window are a padded chair with ottoman and side table. There are a desk and chair against the wall, so you can get some work done. Facing the bed are a cupboard with drawers, a make-up table with mirror and a luggage bench. Near the door is a large closet with plenty of space for your clothes. You’ll find a mini-fridge and coffee/tea facilities as well as safe, bathrobes and slippers in the closet. In the nightstand is a console with switches for the lights. 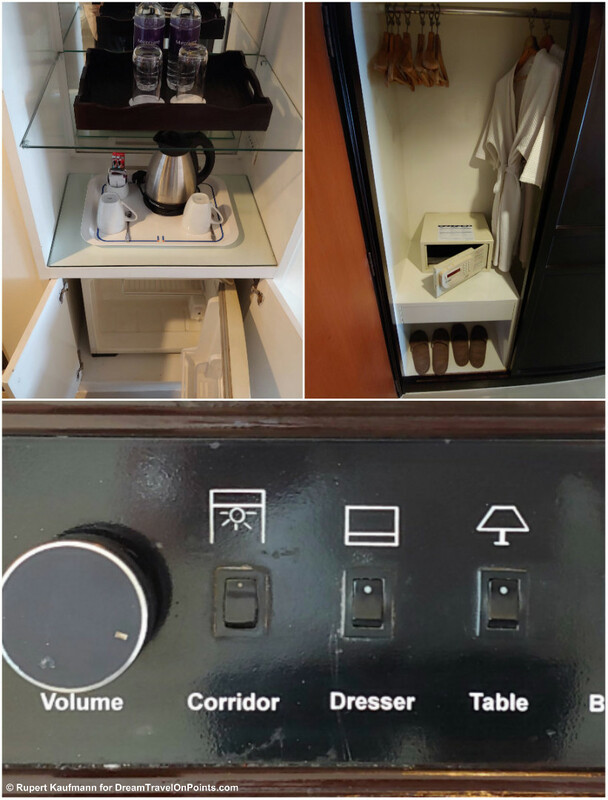 While I appreciate that feature (instead of hunting around the room to find which switch turns of which light), the analog switches clearly dated the hotel to the 70s or 80s – you won’t find power outlets or USB ports next to your bed here! The bathroom is also large and had received a more recent make-over. The sink-in-countertop is on the right with plenty of space for your toiletries. Standard Mercure bath products are provided and there is a hair-dryer. 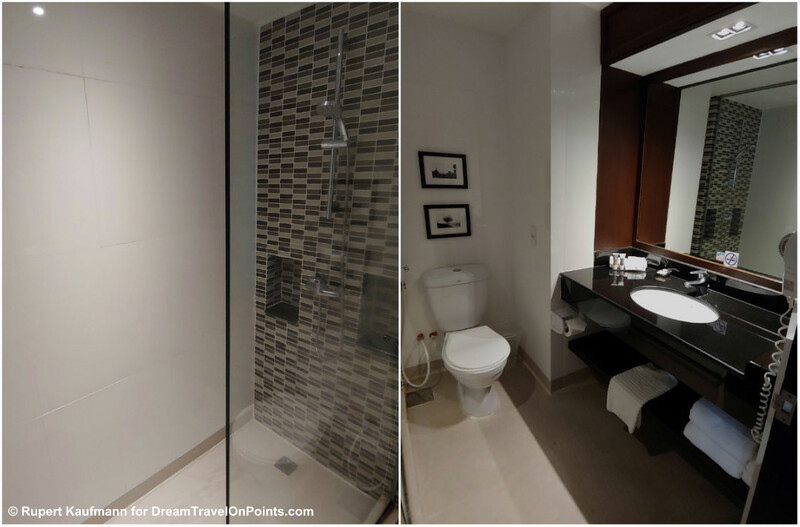 The toilet is in the center and a walk-in shower with a partial glass wall is on the other side. It has a nice accent wall with mosaic tiles, giving it a more modern feel. The shower head was also new and provided good water pressure. The free WiFi internet was very fast with an average speed of 37.6 Mbps – one of the fastest I’ve measured in Thailand. It peaked at over 50Mbps and dropped in the evenings to as low as 11Mbps, but was always fast enough to stream videos. Upload speeds were also very high, so it’s perfect to get some work done! 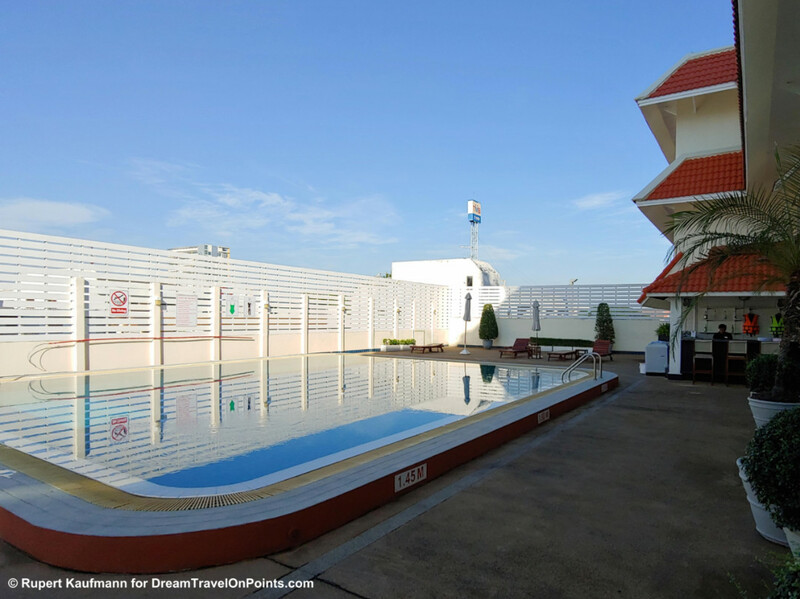 Restaurant & Amenities: The Mercure Chiang Mai has a pool on the third floor with some loungers and a small bar. It’s surrounded by a white wall. It’s not the most inviting place to hang out, but it’s fine to take a refreshing dip after a long day of sightseeing or for kids to play. There is unfortunately no fitness center. 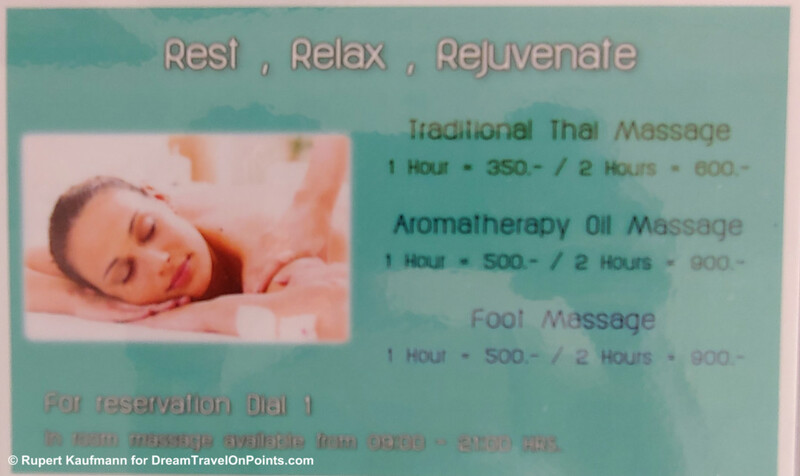 If you need some more relaxation, the hotel spa offers massages and prices are very reasonable, starting at around $11/h for a Traditional Thai massage. The business center in the lobby has two computers and a printer, but the printer was out of order. The front desk assisted with printing my boarding passes. The main restaurant serves a buffet breakfast. During my stay, the hotel wasn’t very busy and the large restaurant was fairly empty. The buffet offered some fresh fruit, breads and jams, as well as eggs and meats from a cooking station. The selection and quality of the food was adequate for the price category. Unfortunately, I don’t have any photos of the restaurant or food – the internet ate them! 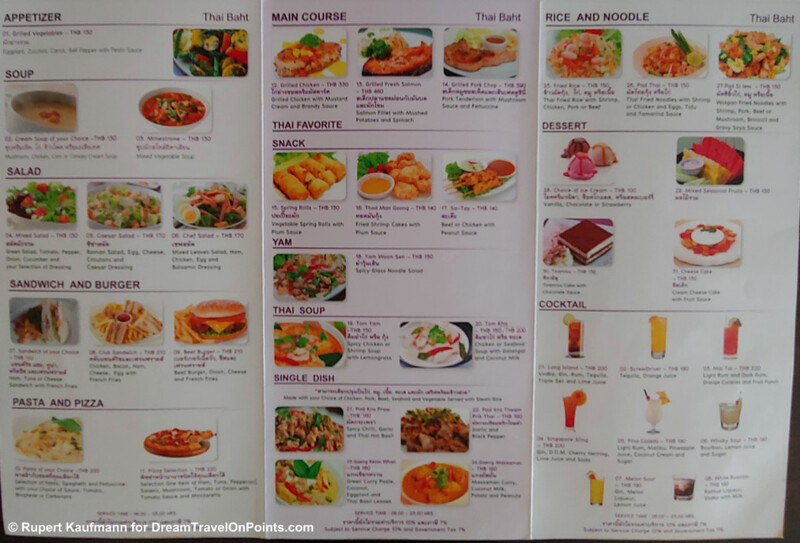 I do have a photo of the room service menu though – you can order Thai, Asian and Western dishes at reasonable prices. I didn’t try it, but it’s nice to have in case you arrive late or are just too tired to go out. 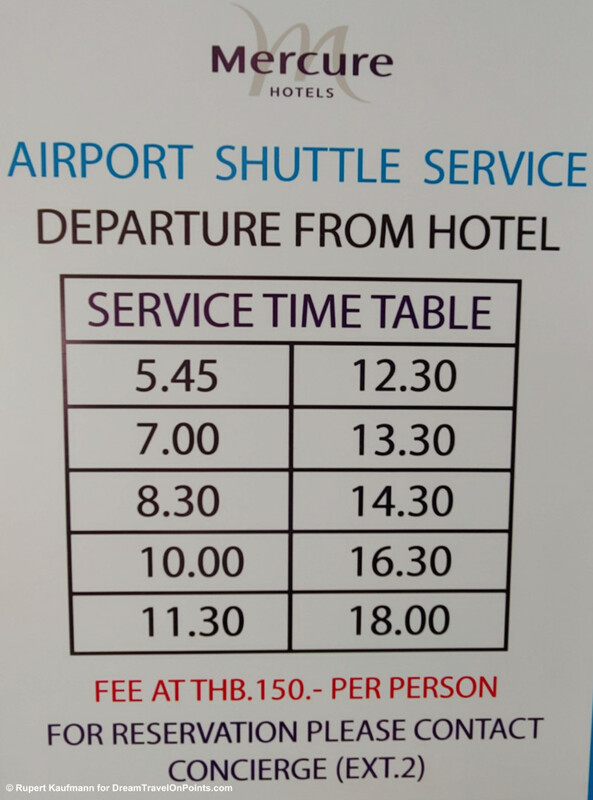 The Mercure Chiang Mai has an airport shuttle. You can arrange a pick-up on arrival and there is a set schedule for your departure, with a price of THB150. That’s about the same as a grab ride, so I did that instead for a little more comfort and flexibility. Value & Rewards: I paid a rate of $46/night. You get a large, well equipped room at a full-service hotel with pool, restaurant, spa and room service as well as friendly service. The property is older, but well maintained and the location is not ideal for first-time visitors. I consider this good value – similar hotels in the old town cost considerably more. You can find the current rates here! 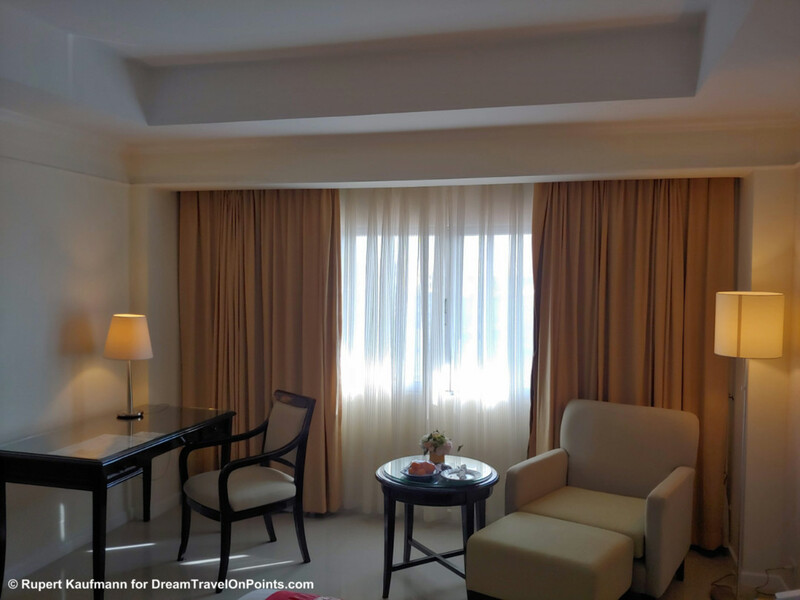 As a Accor LeClub Platinum member I received a two-category upgrade, but I consider it a “fake upgrade” with little additional value. I received a generous welcome amenity of fruits that was nicely presented. The management team left not only a personal letter, but also had a note written on the mirror to welcome me, a first for me and a nice touch. I automatically received free breakfast at the restaurant, a welcome drink voucher and a late check-out at 4pm due to my status. 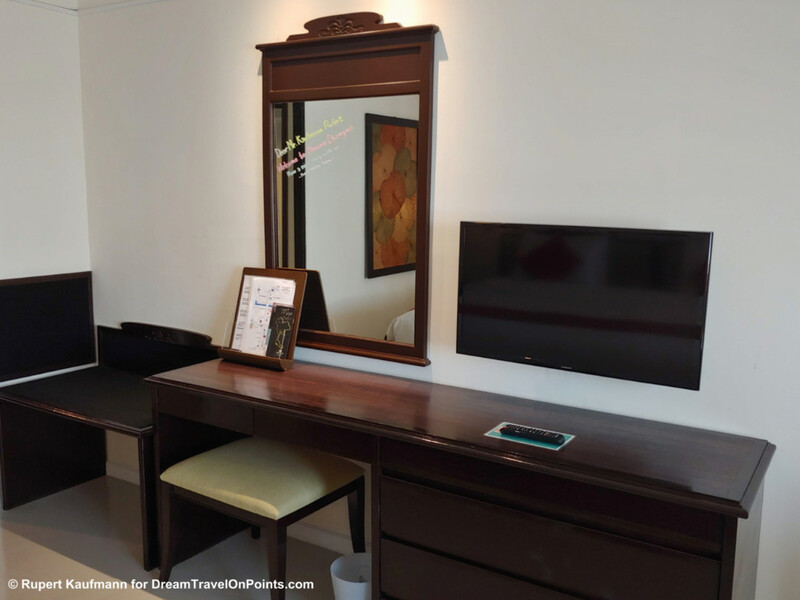 Upgrade options at the lower-end properties are limited and the Mercure Chiang Mai delivered all the promised elite benefits and went above and beyond with the personal notes. I felt well received as an Accor LeClub Platinum member. Bottomline: The Mercure Chiang Mai offers large, well equipped rooms, fast WiFi internet, full-service amenities like a pool, spa, restaurant and room service at a low price. You have to live with the older property and the location North of the old town. While this is not ideal for first-time visitors, if you are returning and don’t mind the walk or a grab ride, the Mercure offers very good value!